It was a pretty busy weekend in the NHL as it usually is. Sidney Crosby didn’t light the lamp but had five assists against the Sabres on Saturday. Several teams continued win streaks bunching the standings in all divisions even more, while a few teams still battle to be in the basement. In fact there is now a website that has been created to keep track of the teams possibly tanking for the right to draft McDavid or Eichel (McEichel.com). Steven Stamkos scored twice and Ryan Callahan scored in the shootout, propelling the Lightning to the top of the standings with their sixth win in a row. Stamkos now has 10 goals on the season and 16 points overall in 15 games. Gustav Nyquist, Darren Helm, and Johan Franzen all scored for Detroit who now sit third in the Atlantic. Both of these teams play the Blackhawks their next time on the ice. Tampa face them on Tuesday and Detroit faces them on Friday. Jordan Eberle scores the eventual game winning goal in the second period beating Henrik Lundavist. Former New York Ranger Benoit Pouliot scored as well in the third period sealing the deal for the Oilers. Edmonton has now been the winner of two straight, while the Rangers have dropped two. James Reimer turns away 38-of-41 shots by Ottawa, and five different players scored goals for Toronto who now have won two games in a row. Despite outshooting the Maple Leafs 41-30, the Sens drop their second straight and are now six points behind division leader Tampa. The Ottawa Senators travel to Vancouver to take on the Canucks on Tuesday, while Toronto plays host to the rival Boston Bruins on Wednesday. Trevor van Riemsdyk scored his first NHL goal and two other Blackhawks added goals in the first period to beat the San Jose Sharks. Brent Seabrook and Niklas Hjalmarsson scored the other two in the big first for the ‘Hawks. Emotions ran high Sunday night as Ryan Kesler faced his former team the Vancouver Canucks. The win wouldn’t come in regulation as both teams needed overtime and a shootout to declare a winner. 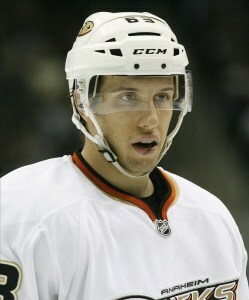 When it was all said and done, the Ducks came out victorious thanks to Nick Bonino’s shootout goal. Two games on the schedule on Monday night. The New Jersey Devils are in Boston to take on the Bruins and the Calgary Flames are in Raleigh to take on the Carolina Hurricanes.